We’ve now added more sectors in addition to Financial Services, Tech and Law, with more to come! 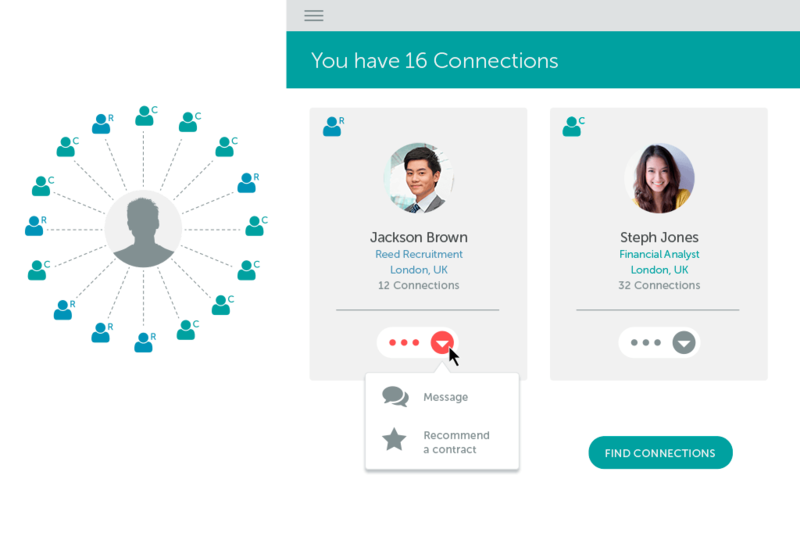 iContract puts you in front of clients and recruiters. Grab their attention with your unique contractor profile. Chat with them directly. 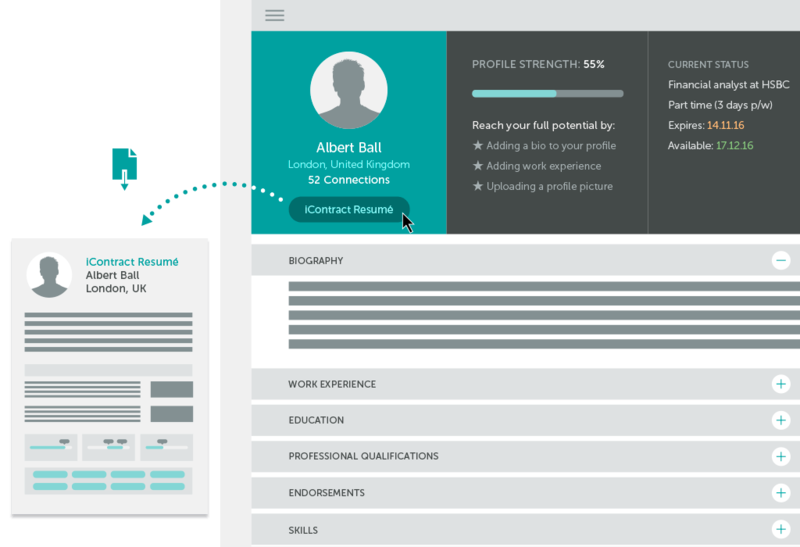 Take advantage of highly useful tools, such as generating an instant CV from your profile, ready to send to a client or a recruiter at the touch of a button. Simple. 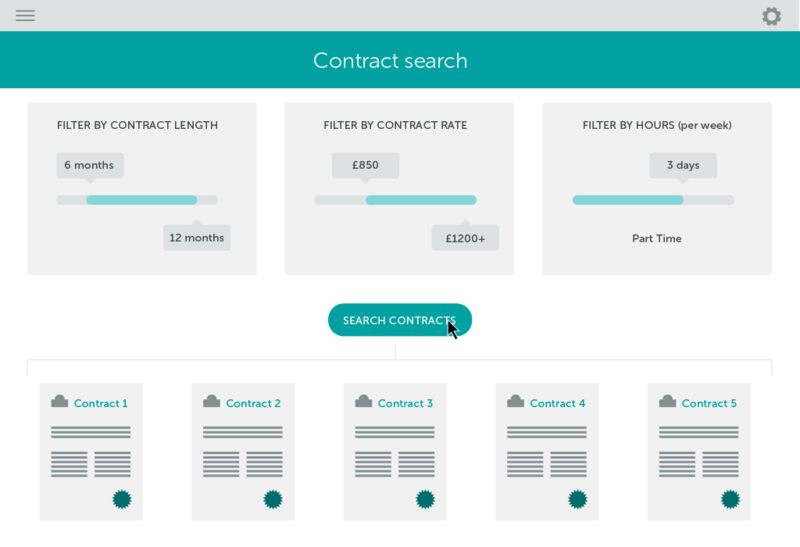 Search for your next contract using focused criteria, including skill set, day rate and contract length. Clients and recruiters will find you and offer relevant jobs. 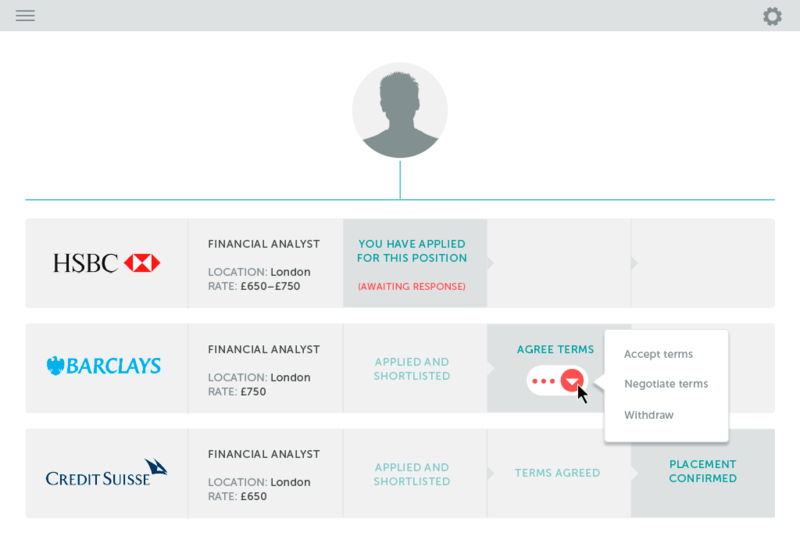 Applying for your next contract is as simple as one click. 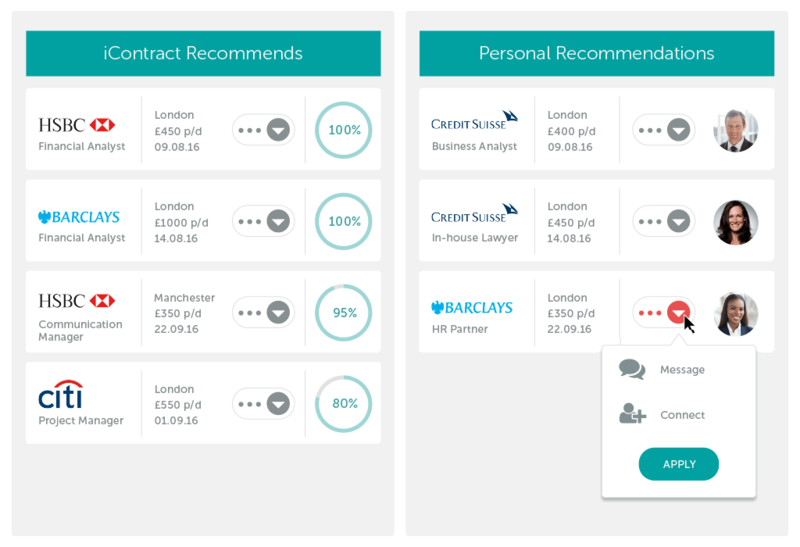 Our smart recommendation engine will find contracts tailored to your profile and contract preferences. Or simply let clients or recruiters send you personal recommendations. Check the status of applications you've made, make the next move or wait for clients or recruiters to respond. No more applying for positions with no knowledge of whether your application has been received or what stage your application is at, giving you more control over your job hunting activity. Search and connect with other contractors, clients and recruiters instantly. Stay connected, communicate directly and expand your network through our community. Find a reputable accountant, buy professional insurance or get advice on your mortgage: We’ve found the right people to help you get the services you need and often at a discount. Just one click and they’ll get in touch. Is it free to use iContract? iContract is absolutely free to use for contractors, with no hidden charges. What type of contractors can use iContract? iContract is designed for professional contractors or consultants in the sectors we cover. No matter whether you work on a project basis, act as an independent consultant to single or multiple clients or cover interim positions, iContract can help you find your next contract or connect you with your next client. What type of contracts can I find on iContract? You can find contract jobs in the sectors we cover, including project-based contracts, interim positions, independent consultancy work and freelance positions. What industries do you cover and do you have plans to cater to different industries in the future? iContract has recently added industries such as Energy, Healthcare and Pharmaceutical, amongst others, in addition to its initial industries; Financial Services, Tech and Law. We intend to broaden into even more industries in the near future. What do you offer over and above other job sites? iContract goes beyond a typical job site. We’re bringing the personal touch back to the contract search. 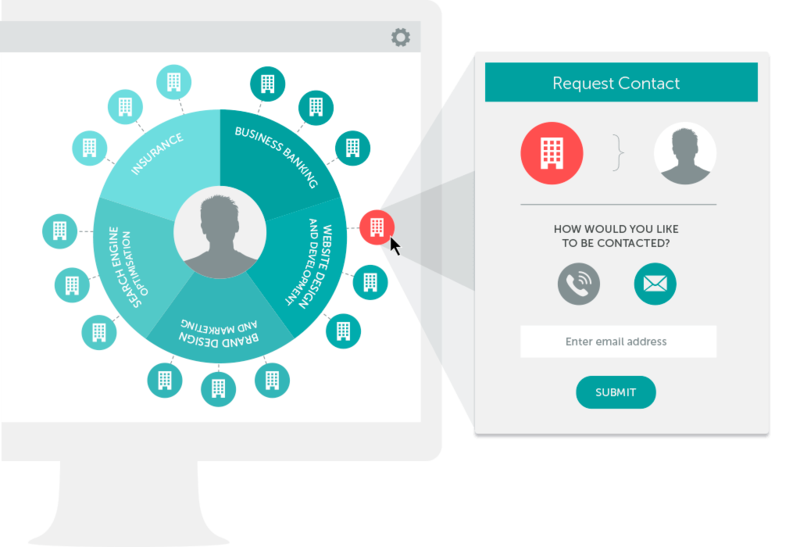 With iContract, you can look for contracts based on specific criteria and communicate directly with clients and recruiters. You can establish and maintain a professional network, access third party services tailored to contractors’ specific needs and stay informed on market trends and news through advisory editorials and offline events. Make use of our resource library to help prepare you for the contracting journey ahead or to simply enhance your existing knowledge. 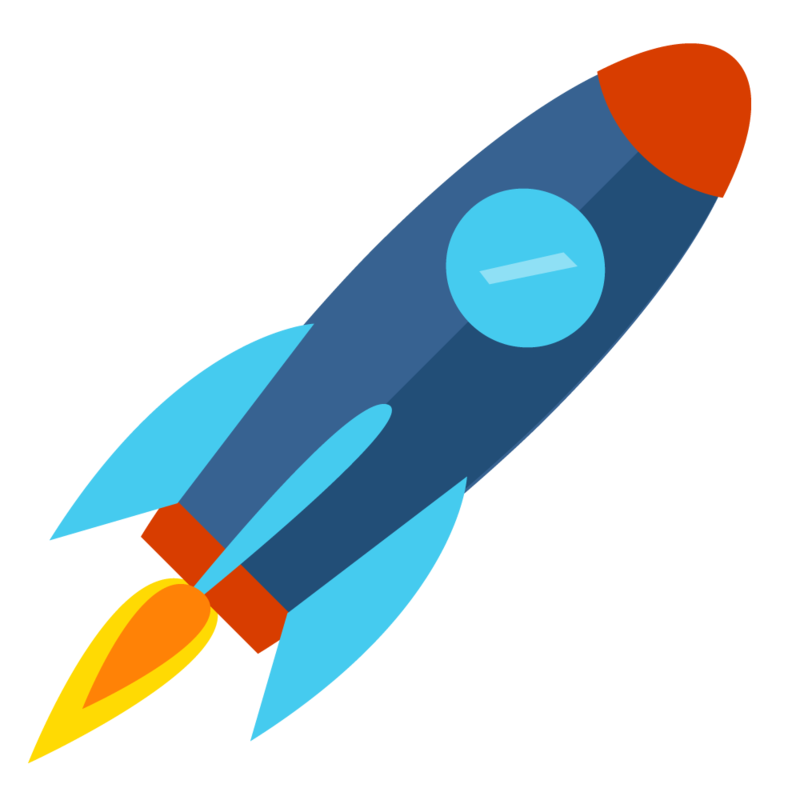 These resources are completely free for registered iContract users. Follow us across our social communities to stay informed on news and trends in the contracting market. Visit iContract Facebook page. Visit iContract LinkedIn group. Visit iContract Twitter profile. Read iContract Blog. Interested in investment opportunities and partnerships?